It is an even more awkward matter for black female legislators, for reasons that are both political and deeply personal. Many of them represent districts that are heavily African-American and in which the most dependable Democratic voters are women. And these lawmakers are deeply conscious of the history of black men in America being wrongfully accused of sexual misconduct. Lashrecse Aird, who was the youngest woman ever elected to the state House when she won her seat in 2015, acknowledged that conversations at the intersection of race and gender “are always sensitive to have.” But Ms. Aird, who is black, said the state needed to use the scandals involving Mr. Fairfax, Gov. Ralph Northam and Attorney General Mark R. Herring to grow on both fronts. “How are we going to take everything that’s happened and move Virginia forward,” she said. 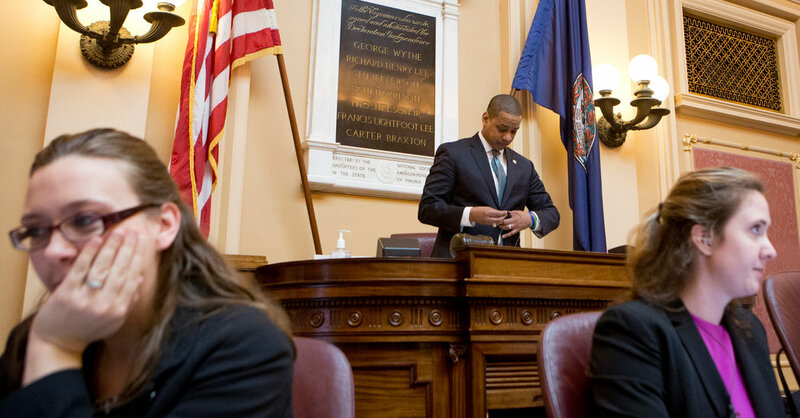 What frustrates Erin Matson, an abortion rights activist in Arlington, is what it will mean to Virginia women if Mr. Fairfax remains lieutenant governor, a post that includes the high-profile role of presiding over the state Senate every day the General Assembly is in session. “When we say we believe women and we trust women, we need to set an example for women and girls throughout out the commonwealth who deserve better,” said Ms. Matson, who is white. The only good outcome to what has been a humiliating and painful episode for Virginia Democrats, say many party officials, would be the election or elevation of more women, particularly minorities. Few in the Capitol can speak to what a difference it makes to have more women in public life as Delegate Vivian Watts can. The senior-most woman in the House, Ms. Watts was first elected in 1981, when the Legislature was still dominated by holdovers from the segregationist, and white male-dominated, political machine once led by Harry F. Byrd. In a brief interview between meetings, Ms. Watts said the stain on Virginia’s three executives had “absolutely” underscored how crucial it is to elect more women in the next round of state elections.